Depression and bipolar disorder are serious psychological illnesses that can have deep and profound effects on people's lives. This means people can often get them confused with one another, even medical professionals, sometimes resulting in patients being misdiagnosed and not getting the help they need. 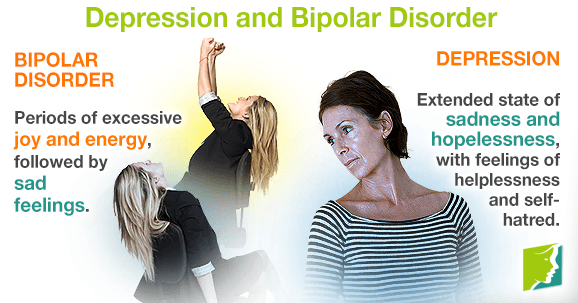 Read on to find out more about the signs and symptoms of depression and bipolar disorder. This illness was previously known as manic depression, and is characterized by radical mood swings in which the sufferer is often unable to feel a "normal" mood, but instead will have periods of feeling extremely high and energetic – a mania – followed by periods of feeling incredibly low and lacking in energy or depression. Depression is a mental illness in which the sufferer has to endure a chronic feeling of sadness and hopelessness, which can get worse over time if left untreated. Over time, the person might become socially withdrawn, experience a change in personality, or maybe become more aggressive. In some ways, bipolar disorder and depression mirror each other, but there are marked differences between the two. Bipolar disorder has to last a week to be officially diagnosed, and so it is worth keeping an eye on depression in the long term in order to see if bipolar might be a more accurate diagnosis. However, it is important to speak to your doctor about any behavioral changes, and avoid self-diagnosis.